The picture above is of Graham Everett of Shettleston Harriers and Scotland winning the AAA’s Mile Championship in 1958 with Murray Halberg of New Zealand in second place at London’s White City. It is one of Scottish athletics best known pictures – and rightly so. Graham won the Scottish mile championship no fewer than eight times in all, seven of them consecutively. He set Scottish records at the Mile and Two Miles. He won the Scottish Senior Cross Country Championship in 1960 after an epic battle with Alastair Wood of Aberdeen who was running for Shettleston at the time and represented Scotland in four world cross country championships. The statistics are summarised in the following tables. First, his victories in the SAAA Mile Championship. *The Crabbie Cup has been presented since 1944 to the athlete whose performance in the Senior Championships is considered by the General Committee to be the most meritorious. The Coronation Cup is awarded annually to the athlete considered by the General Committee to be the outstanding Scottish athlete of the year. In 1956 Everett shared both trophies with JV Paterson. A year later at the same meeting, Derek Ibbotson was timed at 3:58.4 which was a British record and a best for a European. Berisford was second in 4:06.0 with Everett third in 4:06.6. In accordance with the rules in force, Berisford’s time was not recognised as a Scottish record because he was not born in Scotland and Everett’s time was recorded as the Scottish record. A month later, Alan Gordon ran 4:03.4 behind Ibbotson’s world record breaking 3:57.2. This was the fastest ever by a Scot but when they met in the Emsley Carr Mile at the White City in August, Everett was second in a personal best of 4:06.0 to Gordon’s 4:06.8. Came the AAA’s Mile Championship three weeks later and, the race being won by Brian Hewson in 4:06.7, Everett and Berisford were both timed at 4:07.5. Over the period 1956 – 61, Everett had a better record in the AAA’s than Berisford: a first, a third, two fourths and a fifth to Berisford’s of a second, a third, two sixths and an eighth but there was not much between them. Derek Ibbotson came up to Glasgow quite frequently and Hugh Barrow (pb 4:01.0) remembers doing rep sessions with Graham and Ibbo at Westerlands track. He reckons that Graham could and should have been the first Scot under four minutes – quite an admission from one who to many others should have had that honour. Hugh remembers Graham as a fierce competitor and typical of that generation of Scottish endurance athletes. At one point, Hugh remembers, he organised a string of betting shops and I remember an article in the ‘Daily Record’ with a picture of Graham in a bowler hat under the headline of ‘The Bookies’ Runner’. The shop is now known as Interscot and Graham has no connection. Hugh also tells me that when working in Glasgow Graham used to do reps up Great George Street, just off Byres Road..
Winter: September – November 1955. Monday: Afternoon – 5 miles cross-country with 100 – 300 yard bursts. Evening – 5 – 6 miles road work with bursts. Tuesday: Afternoon: Same as Monday. Wednesday: Afternoon – 6 – 7 miles cross country with fast spells; Evening – Rest (Cinema or Theatre). Thursday: Afternoon, Evening: Same as Monday. Friday: Afternoon, if no race, on Saturday, 5 miles cross country. Saturday: If no race, cross-country and road, usually anything between 8 – 10 miles. Sunday: 12 miles road and country. Similar to above but track was used on Tuesday and Thursday evenings. Monday: Afternoon – 5 miles running on grass with about 6 – 8 200 yard strides. Evening: 2 miles warm-up, 10 x 440 yards at 60 seconds. Tuesday: Afternoon, Evening, same as Monday. Sunday: 12 x 200 yards at three quarters speed. The entire article is well worth looking at but for now, nine sessions a week, rep sessions of 3 x 880 in 2 minutes and 10 x 440 in 60 are very like modern day sessions – eg Steve Cram says that his favourite session was 10 x 400 in 60 with a minute rest! 1958 was the big year: Empire and Commonwealth Games year with the event being held in Cardiff. Always looking for races, Everett travelled to England a lot and his first real races of the season resulted in victories at the Sward Trophy Meeting (there were many of these Trophy Meetings in England at the time with competition usually of a high standard), the Northern British Games (4:06.3) and the SAAA Championships (4:07.0) in a championship best. His really big moment came on the 12th of July at the White City Stadium in London where he won the AAA’s mile from Murray Halberg. There were Heats on the Friday night and Halberg was the fastest qualifier with 4:06.7 although Everett, Berisford and Gordon all qualified easily. The final on the Saturday suited Graham Everett to a T. Laps of 62.6, 65.7 and 62.6 again set up a fast last lap. Everett took the lead on the back straight and was never caught winning by a full seven or eight yards from Murray Halberg. His last lap took just 55.0 seconds. Berisford was third and Gordon fifth. All three were selected for the Empire Games but things did not go well for Graham. He had also been selected for the 880 yards where he was in the third Heat. Unfortunately he was spiked and finished third in 1:55.0. This may well have had an effect on the Mile where he just failed to qualify for the Final when he was fourth in the first Heat in 4:10.0. This, plus a poor run in the Emsley Carr mile a fortnight later probably cost him a place in the GB team for the European Games. In a late season race at the White City when four runners were under the four minutes, Everett set a personal best of 4:03.5. A month earlier Berisford had set the identical time in a GB v the Commonwealth match. After a quiet 1959 when did set a Scottish Two Miles record, he had what many consider to be his best year – 1960. 1960 was the year in which he really had a go at cracking the four minutes and at qualifying for the Rome Olympics. In the SAAA Championships in July he front-ran a personal best of 4:02.8 which was fractionally outside the Olympic qualifying of 4:02.5! At the British Games in August he he did a personal best of 3:45.7 for the 1500 metres – and at the same meeting Berisford ran in the mile 4:03.3 in the Emsley Carr Mile. By the end of the season Graham had not achieved either of the targets but had only just missed out. He kept competing for another four years at a fairly high level but his best times had all been set by the end of 1960. District: 1955: 14th; 1956: 14th; 1957: 3rd; 1958: 2nd; 1959: 1st , 1960: 1st, 1961: 1st; 1962: 4th. National: 1955: 4th (Junior); 1958 2nd (Senior); 1959: 4th; 1960: 1st; 1961: 2nd; 1963: 29th; 1964: 10th. In addition there were four appearances in the International Championships – in 1959 when he finished 31st; 1960 22nd, 1961 18th and 1962 71st. Then there were all the team golds, silver and bronze that he helped his club to win – six golds in the County Relays plus two golds, two silvers and a bronze in the District relays plus two golds from the McAndrew Relay which was a major competition at that time. With its many highlights it would be difficult to do justice to his career in detail. Instead we can look at his victory in the National Cross Country race in 1960 which many insist is the best cross country race they ever saw. In 1958 he was second to Andy Brown (Motherwell YMCA) winning his first senior championship. A year later and he was fourth with Alastair Wood in first place and then in 1960 he won everything including county and district championships before the National. In the Districts at Renton, he won by over a hundred yards from Joe Connolly (Bellahouston Harriers) and Andy Brown. Then came the National. 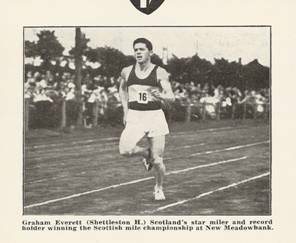 I quote from Colin Shields’ “Whatever the Weather”: “Shettleston miler Graham Everett won the National Senior title, defeating the holder Alastair Wood. Everett set a fast pace from the start with only Wood being able to stay with him, and at half distance, with the pair well clear of the pursuing field, Wood took up the running. Everett then displayed his track speed, which he had carefully honed in the weeks before the race with victories in the 1000 yards (2:18.2) and 3000 metres (8:49.0) at Shettleston’s winter track meeting and drew away to win easily by 30 yards from Wood with Andrew Brown finishing a distant third 500 yards behind.” Maybe winning by 30 yards after such a race looked easy to Colin but the reality is that it was a hard man-against-man race all the way with neither tough-minded individual prepared to yield easily. I’m only sorry that it was run after the ‘Scots Athlete’ had the chance to report on it! The 1950’s and early 60’s was a time when the standard of road running in the country was at one of its highest peaks ever. Shettleston with Everett, McGhee and company were almost on a par with the VPAAC team with Binnie, McLaren, Calderwood while Bellahouston (Connolly, Dickson, Fenion) were not far away either. Never ever being slower than fourth on a stage (and that was the very difficult second stage is a very creditable record..
For more fascinating detail of his running in this relay, look at the Edinburgh – Glasgow page on this website and see the story of all the races run at this time. The picture below is of Graham winning the National in 1960 and taken from Colin Shields’ book – click on it for a bigger version. Graham’s running career was short – he appeared as a Junior in 1955 and had run his last race before 1965 but he was still putting back into the sport fully 50 years later. A qualified Senior Coach, later Level 4, he started coaching his daughter Andrea who was herself a Scottish International Middle and Long Distance runner, and went on to coach many, many more athletes. It was common to see him on winter evenings at the trackside at Crown Point in Glasgow’s East End coaching athletes despite suffering from arthritis. He also assisted with Scottish squads and was a regular for a while at Senior and Development Squad days. He was a great athlete at a time when the standard was high. After the above profile was written, I spoke to Graham about his career and I’ll just put the conversation into a Question and Answer format which is maybe more rigid than the conversation was but which has all the salient features. His daughter Andrea is living in America and still running and still winning races as a Masters athlete. Jimmy Graham was also the Scottish Rugby Union team doctor: now retired, he keeps himself fit at the Esporta Sports Centre in Bearsden. Graham died in Glasgow Royal Infirmary on 20th January, 2017.